RHINO WIPES LEAD THE CHARGE! Are you looking for an industrial grade white wiper that is low linting, smooth textured, highly absorbent and suited for high usage disposable tasks? WHITE RHINO WIPES are what you’re looking for! This tough, little wiper has all these bases covered, and more! The toughness come from the polypropylene component of the wiper, making it strong, durable and tear resistant. 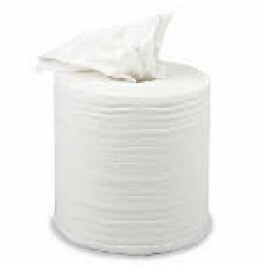 Thankfully the roll is perforated into 220 sheets that can be easily torn off into standard sized wipes to reduce wastage. The absorbency comes from the other component of the material mix...high concentrations of wood pulp, which is capable of soaking up water, oils and solvents. It works great with chemicals and will not fall apart when wet. The smooth texture of the material means that it is suitable for wiping tasks that call for a non-abrasive material. Furthermore, the fibres in this wiper are tightly bound which also makes it suitable for tasks that require a low linting cloth so that surface lint or fluff are not left behind after cleaning. INDUSTRIAL – This wiper is very effective in cleaning solvents, chemicals and industrial spill. Because it comes in easy-tear perforated sheets, cleaning has never been this convenient and fast. This is clearly a great replacement of the traditional T-shirt rags. AUTOMOTIVE – These excellent automotive cleaning supplies are used in cleaning your bus, car, boat, truck, taxi, van and any other type of automotive. It’s non-abrasive and lint-free so you can clean the glass, mirror and windshield without having to worry of any lint or fluff that will be left behind. HOSPITALITY – Food preparation industry demands cleanliness at all cost. White Rhino Roll meets this demand as it’s an excellent wipes that can be used from almost anywhere – from your kitchen, sink, tables, oven, utensils and a lot more. It’s high absorbent so cleaning grease, oil and other kitchen dirt will be a breeze. HEALTHCARE – Since it is imperative that this industry should uphold cleanliness and proper hygiene at all times, White Rhino Rolls are effective healthcare cleaning cloths that serve as an aid to healthcare professionals in delivering this goal. It’s strong, tear-resistant and durable that can be used in vast areas of cleaning – from hospital dirt such as urine and vomit to cleaning hospital tools. PAINTING – Painters are avid fan of White Rhino Rolls as this 220 white low lint polypropylene wipes can absorb paints and solvents easily. This wipe does not tear apart even though it’s already wet. If this won’t impress you as a painter, I don’t know what else would. PRINTING – Get the best value for your money with this economical white rag replacement that works well in cleaning ink and print equipment and absorbing solvents. These are the only few industries that have been satisfied with the result given by WHITE RHINO WIPES. If you want something that is not only economical and cost-effective but is also durable and delivers great cleaning result, give WHITE RHINO WIPES a try today. You would be surprised at how cleaning has been made easier by these wipes on a roll. Other related products from TIDDOX 's range of cleaning cloths include the LOW LINT INDUSTRO WIPES , the JUMBO RHINO ROLL, and the RHINO WIPES POP-UP BOX.